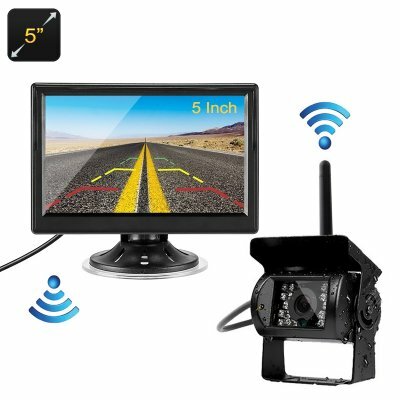 Successfully Added Rear View Parking Camera - 2.4G Wireless, 5-Inch Display, IR Night Vision, 800x480p, Waterproof Camera, 120-Degree Viewing Angle to your Shopping Cart. With this 5-Inch wireless car monitor and parking camera, you’ll be able to clearly see what’s happening behind your car straight from your dashboard. Thanks to the 2.4g wireless connectivity between the rear-view camera and TFT LCD display, this car accessory is easy to install. Simply attach the camera to the rear of your car and place the screen on your dashboard. From now on, you’ll always have a clear overview of what’s happening behind your vehicle. Not only does this increase your safety while driving in reverse, it also makes parking your car a lot easier. With this car rearview camera, everybody will be able to easily park their car in reverse. The 5-Inch TFT LCD display treats you with crisp 800x480p resolution. This means that you’ll be able to enjoy clear and detailed images straight from your dashboard. Besides pairing it with your wireless parking camera, this car monitor can also be hooked up to a car digital TV receiver box. When done so, you and your passengers will be able to watch movies, series, and TV shows during upcoming holidays from the comfort of your car, RV, or caravan. By supporting both 16:9 and 4:3 aspect ratios, you’ll be able to enjoy both classic and wide-screen films without experiencing a loss in quality. With its durable waterproof design, the rear view camera can be used in virtually any environment and weather condition. Its 2.8mm lens provides clear images at both day and night thanks to its night vision capabilities. With 18 individual IR LEDs, your parking camera is guaranteed to deliver detailed images after dark. By supporting a 120-degree viewing angle, you can be assured that nothing happening behind your car stays uncaptured with this rearview camera. Therefore, you no longer have to worry about nasty surprises while driving or parking your car in reverse. This car monitor comes with a 12 months warranty, brought to you by the leader in electronic devices as well as wholesale electronic gadgets..
Arabic: - كاميرا مواقف السيارات - Chinese Simplified: - 停车照相 - Czech: - Parkovací kamera - Danish: - Parkering kamera - Dutch: - Parkeren Camera - French: - Caméra de stationnement - German: - Parkplatz-Kamera - Hebrew: - חנייה מצלמה - Hindi: - पार्किंग कैमरा - Italian: - Telecamera per parcheggio - Japanese: - 駐車場カメラ - Korean: - 주차 카메라 - Malay: - Tempat meletak kenderaan kamera - Norwegian Bokmål: - Kamera parkering - Romanian: - Camera parcare - Russian: - Парковочная камера - Spanish: - Cámara de aparcamiento - Thai: - กล้องที่จอดรถ - Turkish: - Park kamera - Vietnamese: - Bãi đậu xe máy ảnh.